According to the Director of Yale’s Prevention Research Centre David Katz, as a society when it comes to obesity we’re facing a flood. I’d argue we’re facing many. We’re facing a flood of empty sugary calories. We’re facing a flood of childhood obesity and we’re facing a flood of diet related chronic diseases. And all of these floods have been here for some time now. In regard to obesity, rates have been rapidly rising for decades and while there have been a few hesitant blips here and there suggesting a leveling off or even slight dips, in a best case scenario that would signify that our flood waters have crested which while certainly better than rising, is far from reassuring. In regards to empty sugary calories and more specifically those coming from sugar sweetened beverages, the recent and slight dip in soda consumption may well be more than offset in the sharp rise in sugar-sweetened sport and energy drink consumption and still sees soda consumption at rates nearly double those of the 1970s. In regards to diet related chronic diseases what I was taught in medical school in the 1990s as “adult onset diabetes” is now regularly diagnosed in elementary school aged children. There’s no denying these are floods. When faced with a literal flood rather than these proverbial ones, a government’s responsibility is clear - mobilize resources and get to work - first building levees and then ultimately upgrading infrastructure so as to guard against a future recurrence. Levee building follows a pattern too. Fill more sandbags than are likely required and stack, stack, stack, where no single sandbag would ever be expected to do the job in and of itself. So what sort of response has government adopted in response to our combined floods of obesity, added empty sugars and diet related diseases? For the most part, and with rare exceptions, rather than build levees and stack sandbags the government’s primary response has been to focus on swimming lessons and to suggest or support the notion that personal responsibility, education and attention should serve to deal with these floods rather than sandbags. Two days ago we saw the demise of a novel sandbag in New York City when State Supreme Court Justice Milton A. Tingling Jr. quashed the plan that would have seen a New York City ban on the sale of servings of sugar sweetened beverages larger than 16oz - a size which in the 1950s Coca-Cola advertised, “Serves 3 Over Ice-Nice”. Justice Tingling ruled that this sandbag was imperfect as it left other sugar-sweetened beverages like flavored milk off the hook, that it would not be stacked in each and every levee, and that it would be difficult to administer. No doubt there is truth in all of Justice Tingling’s concerns. 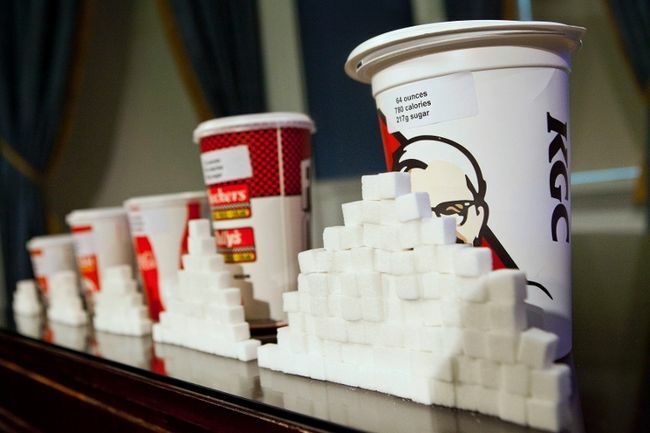 The cup size ban would be difficult to administer, wouldn’t affect sales of even 2 liter bottles of the stuff in corner stores, and no doubt would not in fact stop the overconsumption of sugary beverages. But it would have been a sandbag. The inconvenient truth here is that we do have a flood, and until we stop equivocating over making perfect sandbags, people, including our children, will continue to drown as our experiences with the rising flood waters of the past 30 years have clearly demonstrated that no amount of swimming lessons are sufficient to fight the relentless current that’s sweeping us to ill health. Flooding precludes the luxury of perfection, and until the government recognizes that fact for these very real floods and starts stacking sandbags, don’t expect the flood plains to empty any time soon.